the poet longs for asylum or exile—but where is there a place on earth not torn by war or oppressed by despots? First, because I haven’t the choice to not be. Even the poetic forms of Names have diverse pedigrees. Twelve poems are ghazals, an ancient Persian poetic form, and half that number are translations with accompanying glosses. In addition to Akhmatova, we encounter Kateb Yacine, an Algerian writer notable for his advocacy of the Algerian Berber cause; and the Belgian poet Guy Goffette whose poems Hacker has translated. 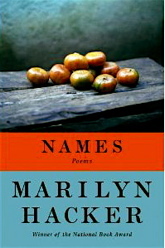 Names is dedicated to three poets who died in 2008—Hayden Carruth, the Palestinian poet Mahmoud Darwish, and the African-American poet Reginald Shepherd—and one ghazal is written in memory of the Pakistani poet Faiz Ahmed Faiz, imprisoned for his stand against bloodshed in Bangladesh in the 1950s. However, he does not dismiss his staff in summer. In the first couplet, both lines end in the rhyme and refrain; the rhyme scheme is aa ba ca for five or more loosely connected couplets. The second line of each couplet ends with a refrain of one or a few words, preceded by a rhyme. Hacker, who translates from the French where couplets are commonplace, may have come to the ghazals easily. Even when the poet’s sipping coffee in Le Sancerre in Paris, “disaster is inexorable somewhere. . . no more contained by meter than by dependable black coffee.“ The poet has a keen sense of ominous military presence; even a couple of cops on a Parisian street outside her window make her jittery. Late summer harvest of those who grow nothing. With the door locked, blinds drawn, music blaring? Oh, nothing. There is not only the distance between the poet and her friend or lover; there is the distance separating diverse cultures—countries and religions and clans at war. The aching with absence is the ache for a beloved husband or brother or daughter, fallen in war across the ocean, and it is the ache of the mystics, and major poets like Marilyn Hacker, for a truer world. Zara Raab’s poems and literary journalism have appeared in Flash, West Branch, Arts & Letters, Nimrod, Spoon River Poetry Review, and major newspapers such as the St. Louis Post-Dispatch. Her Book of Gretel is published by Finishing Line Press.